Today no change was found but Karen and I did our part by recycling bottles found in my office recycling bin and will place the money in today's total! We received a total of $1.40 in the form of a dollar bill, a quarter, and three nickels. One one hand, we helped clean up the landfills by turning in all these water bottles and on the other, we made our pot just a lil bit bigger :) It's a win/win! Today we found a total of 12 cents in the form of a dime and two pennies. Penny One was found while walking to the gym ; penny two was found right by the leg press machine (where I pressed a personal record!!). 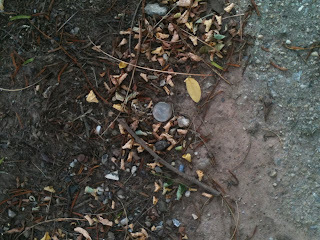 The dime was found right by the decline that leads to my favorite jogging path. Today we found a total of 27 cents in the form of a grimy quarter and two pennies. We are also adding the penny found on Monday night that was left in the change purse for accountability at a later date. The quarter was found at a pretty busy intersection here in Brooklyn - the tails side of the coin looks rather worn but still recognizable against the backdrop :) . Penny number one was spotted right outside my favorite eatery- the Oasis off 4th ave and number two waited for us in front of the doctors' office. My youngest daughter is quite under the weather so mommy's been running around getting all the necessities to help her along. Poor baby even got sick this morning :(. A mother's work is never done - now off to cook dinner and watch a few Disney movies! Here's the proud coworker Trevor holding up the mended twenty! Here is the twenty my coworker found ripped to shreds over the weekend. Great job taping it up! Thanks for blocking off parking! Found this coin on the way to the gym!! Today we found a total of four pennies - three pennies found in the company of the Good Morning America crew- what wonderful people! My children are fond of our interviewer Mr. Cameron Mathison! My daughter Brianna let him beat her to one of the pennies in the parking lot. We taught him a thing or two about change hunting- like rules #1 and 2- never hunt without sunglasses and anti bacterial gel! Our changepot segment will air this Thursday. If they post an internet link i'll cite it in the right hand column. The temperature is far too hot out to continue our coin search- my poor Karen is feeling under the weather. 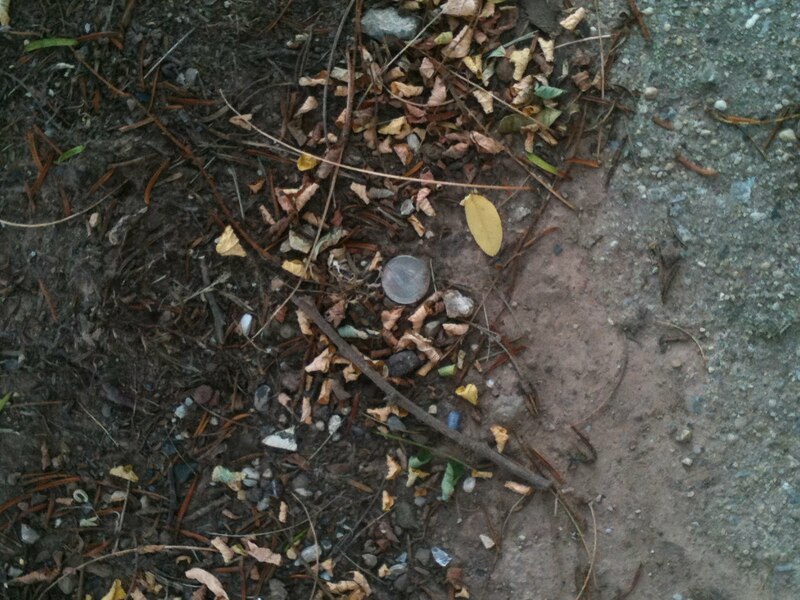 In the past three days we found a total of $0.28 in the form of two dimes and eight pennies. Pickings were slim considering the places we visited this weekend : Queens Center Mall (zero finds!) and Sesame Place in Pennsylvania (all twenty eight cents found). The kids had so much fun and I came home with sunburned shoulders! Tomorrow we welcome Good Morning America to our home for an interview on our changepot endeavor. I'm so excited! More to come later - Have a great one all! Today I found a lone nickel on my way to my car after work today. My co-worker Giselle chuckled as I took a picture of what we like to refer to as 'ping in the wild'. Another co-worker of mine found a ripped up twenty dollar bill over the weekend. Apparently someone was quite upset with the economy or perhaps our currency in particular. Fortunately for Trevor, all four parts were nearby. Trevor plans to patch up the bill and use it accordingly. The Humphery household is abuzz! We were contacted by a producer for a well known TV show to do a segment on the changepot in the coming week! While I have not been faithful in blogging my daily finds, we have still found coins and bills- but as you all know, life tends to get in the way. So much has changed in our lives but one thing is certain- our goals are still intact and once we reach a total of $1500 in found money, we will donate it to worthy causes. My daughter Brianna is still in the process of counting FY11's finds- and once she finishes the total tally, i'll update the total found thus far and the changepot will be fully operational again. Til then, be well my friends ! Life is a funny thing. As I sit here, typing a minor update to our blog, I sneak a peak at our temporary found change container and smile. My family and I have still been picking up change and depositing it there- though I haven't documented my finds like I used to since life happens (new job, new hobby, and marathon training). Our purpose is still intact- we are going to donate the found money to a charity of our choice. Right now I'm heavy in favor of the American Lung Association. The decision isn't mine alone though. I'm going to task my daughter Brianna to count the change collected from FY11 tonight. Once she gives me the total breakdown, i'll post it online. Til then!